Although not officially documented, it is widely believed that Forman Hawboldt was the first manufacturer in Atlantic Canada to design and build two-cycle gasoline engines for inshore fishing boats. His engine was patented as the ‘Canadian Standard,’ and rapidly gained popularity with fishermen throughout Nova Scotia, New Brunswick and Newfoundland. 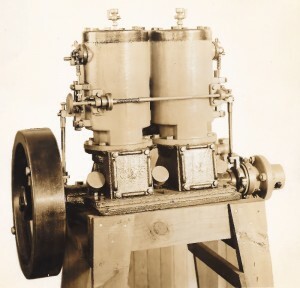 Hawboldt’s early marine gas engine (and other models being developed in Canada and the US during the same time period) introduced radical changes to the Atlantic fishing industry. Fishermen who once relied on wind and sail power were now given the advantage of motor power, enabling them to reach the fishing grounds whether there was sufficient wind or not. The engine’s greatest virtue was its simplicity. There were no complicated valve mechanisms to break or foul, enabling fishermen to make repairs when at sea. “It was commonly said of the two-cycle that it could be repaired with a piece of baling wire and pliers” (Grayson, 1982:11). The two-cycle engine was sometimes called the ‘make-and-break” (a reference to the ignition system) or “one-lunger” (single cylinder) and was instantly recognized by its ‘putt…putt…bang’ sound as boats chugged through the water. Interview with Alan Bremner who worked for Hawboldt’s until he retired.